A most curious thing happened the other day. My stepson, Dylan, was mowing the backyard, when something caught his eye. He scooped it up and came in the house to show me. His excitement caught the attention of my littlest ones, Finn (4) and Moira (2). We put the baby turtle in a plastic bowl, then placed the bowl inside the top of an edged box lid, and finally, on top of the entertainment center where it couldn’t be disturbed. Then I called the local nature center to find out what to do with it. 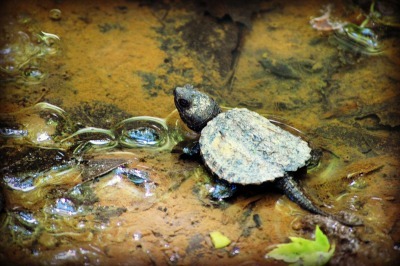 Turns out it was an Common Snapping Turtle. Not exactly pet material, much to Dylan’s chagrin. The naturalist advised us to drive to the nearest river and let it go for its best chance at survival. We put some grass in the bowl and I asked the kids if they wanted to name him. Finn, after hearing it could nip your fingers, decided on “Pincher”. And like that, Pincher became a part of our family. He started to feel a little more comfortable with us, realizing I suppose that we were just noisy and funny-looking, and not a real threat. He began to stretch his limbs out. At one point, I saw him peering over the edge of bowl, his neck stretched an impossible length. 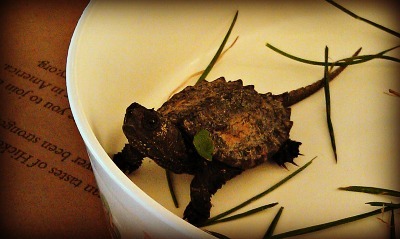 Did you know turtles could climb straight up out of bowls, even babies? I didn’t realize they were that adept at climbing. They are also much quicker than I thought. I walked by Pincher’s makeshift habitat and took a peek. There he was, standing outside the lid next to my candy dish, staring at me. So we decided to modify his temporary lodging. But Pincher couldn’t be kept down. He was aching to run free—er, crawl free? Now that escaping the bowl was old hat for him, he simply flipped himself out and began searching for a way out. 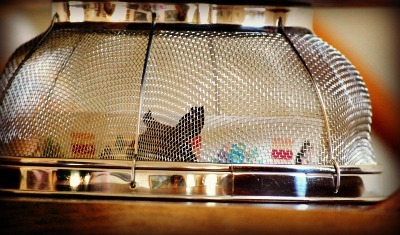 The ingenious little creature even managed to climb up the side of the overturned colander we used as a cover! We decided to release him at Pinecliff, a local park where the Monocacy River runs along one side and a marshy area occupies the other side. It’s the perfect home, with plenty of food sources and hiding places! Pincher Release Team (l-r): Finn, Dylan, & Moira. 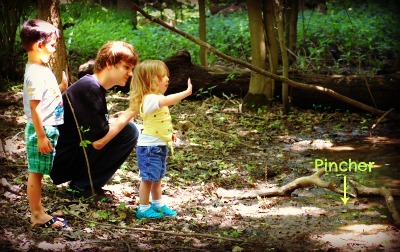 With little fanfare, Dylan placed Pincher in the shallow waters of the marsh, while the kids waved goodbye. It took only a moment before he was moving along, but not before stopping to stretch out his neck again and take one last look at us. We stayed a little longer watching him and playing catch-and-release with the tree frogs before we said our final goodbyes. 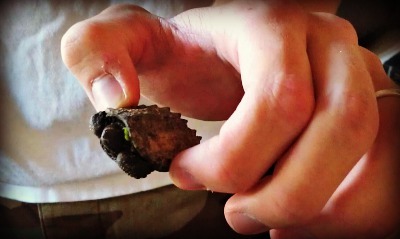 It seems silly to say, since we only had Pincher for a brief two hours, but that little turtle taught me something. See, I was filled with anxiety over a biopsy I had done on a suspicious mole in a weird spot on the back of my upper earlobe (benign, thank God!). I had deadlines to meet and laundry was multiplying before my eyes, and I still had to make preparations for hosting book club the next morning at my house. Pincher reminded me to really live in the present, and not to treat each day as one more thing to check off the perpetual to-do list. It reminded me to be on the lookout for the impossible, because you never know what treasure you might find among the blades of grass. May you find a treasure today! How sweet. Such a precious little creature. So glad he found a new home where he might be able to thrive. And what a tender experience for your children. I love it when life presents us w/ lessons like that. So glad your medical issue resolved well too. Much to be thankful for! Most definitely, I’m thankful every day! I like that, “Dust and Mayhem” 🙂 You know those who really love you don’t mind getting a little dusty! “Heaven in her mercy hide the . Book of Fate…” , it looks like the page that was hidden from you was special in more ways than one. A lovely post and I am so happy that all is well with you!! !